Created to honor the industry’s finest in spa business practices and innovative products, the Best of the Best Awards are divided into two groups—Industry and Supplier. The Industry categories are business-driven and were judged by a neutral panel of industry experts. The Supplier categories are reader-driven, and all nominations were submitted by Skin Inc. magazine readers online via www.SkinInc.com. By utilizing both a neutral judging system and candid reader entries, the Best of the Best Awards is the most unbiased and prestigious honor given in the field today. In the awards’ most popular category, Spa Radiance stood out by using marketing to address three main challenges it needed to overcome: creating points of differentiation, generating community service coverage and boosting sales of its nail services. Firsthand details about the spa’s secrets to marketing success will appear in the February 2008 issue of Skin Inc. magazine. * Invited media professionals to a preview party where key journalists experienced the treatment. * Mailed a press release to local lifestyle media outlets. * Arranged its retail area to display the different peels in order to attract questions and interest from existing clientele. Because of these initiatives, the Facials-in-a-Flash Peel Bar earned San Francisco’s local 7x7 Magazine’s Best of the Best Award. * Drafted an advisory notice for the local media. * Informed clients through thank you letters that their patronage allowed the spa to give back to the community through this program. The results of these efforts were numerous and included a feature article in the local Benefit magazine, as well as the San Francisco Chronicle. * Refurnished the spa’s manicure/pedicure area to feature organic interiors, vegan nail polishes, sustainable moisturizers and scrubs, and natural juices and snacks. * Drafted and distributed a press release before the opening. Nail service revenue increased 10% and the spa received several nods from “green” magazine issues—7x7 Magazine and San Francisco Magazine—for this eco-conscious endeavor. 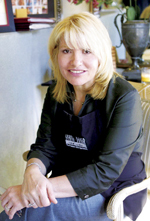 A skin care professional for 30 years, Sonya Dakar definitely has made a name for herself in the spa industry. The products and treatments that are a result of her expertise are highly sought after, and Dakar has become a skin care guru for many budding professionals, including Shawn McClure, an aspiring esthetician who nominated Dakar for this award. McClure sought her help for chronic cystic acne, which Dakar was able to clear up in one treatment. According to McClure, “Her most striking characteristic is that she has an unflagging passion for the skin. Skin is not her job, her hobby or favorite pastime—it’s her life.” This drive is seen not only in the success of her products, but also in her ability to inspire a profession, one student at a time. “Dakar gives me hope that this industry is not a complacent field that will have a minor impact on the individuals who stumble across it. Rather, it is a dynamic entity that is constantly growing and evolving in an effort to always deliver the best results,” writes McClure. Dakar will be profiled in the Face to Face column of the January 2008 issue of Skin Inc. magazine. The company’s collection of eight salon spas in Tucson, Arizona, identifies the areas that are important in order to maintain high morale among team members. Along with offering full health benefits and paid vacation, Gadabout honors individual achievement on a regular basis in order to demonstrate the importance of its employees. The company’s male spa, Gadabout Man, will be the focus of the Spa Snapshot in the January 2008 issue of Skin Inc. magazine. Incentives and bonuses. Through corporate-wide promotions and contests, the spa gives away all expense paid trips, iPods, gift certificates and more. Gadabout also covers the costs for team members to receive ongoing education and attend trade shows. Employees receive flowers on their anniversaries and when they reach goals, and a yearly fashion show is held to highlight every technician’s talent in all departments. The company also provides opportunities and assistance for employees’ family members, and life-enhancing programs, such as Weight Watchers and English-language classes, are offered as well. Team members’ children are invited to participate in the Image Up program that involves a free haircut and health, beauty and fitness tips, as well as self-esteem building initiatives, and financial and goal-setting advice. Gaddy Awards. The annual company-wide awards program honors technicians for monetary goal achievements and outstanding character. Gadabout spends approximately $20,000 on this ceremony in order to provide custom-made awards, food and beverages to its employees in a high-end venue. 87%. The business provides this class to encourage the continuous character development of its team members. Gadabout believes services are only 13% of what influences a client’s experience, and the other 87% is the interaction between employees and clients. During these classes, employees learn to develop their communication and listening skills. A Spa Snapshot on Gadabout Man will run in the January 2008 issue of Skin Inc. magazine. This multifaceted company focuses on the benefits of technology in regard to retail. Using its e-commerce site, www.sartyshops.com, the company is better able to serve clients nationally and internationally, particularly those who live in rural areas. Only seven months old, the site also is used in the company’s Elements and Refuel spas as a reference point for telephone gift certificate purchasers. Not only does this provide easy access for customers, but it also allows spa professionals to provide full attention and care to clients. An article detailing Sarty Mountain’s retail philosophy will appear in the March 2008 issue of Skin Inc. magazine. As “a spa with a medical degree,” Be Medispa offers preventive aging programs that combine the health synergies of bio-identical hormone replacement, detailed nutrition counseling, individualized nutritional supplementation, exercise guidance, lifestyle modifications and stress management skills. A column detailing the architecture of this balance by Be Medispa will appear in the Spa, MD, section of Skin Inc. magazine’s January 2008 issue. The doctor makes the difference. The company believes that, in order for a spa to be deemed “medical,” there should be convincing evidence that the service promises are based on science and delivered with medical expertise. Paul Hester, MD, is present and active in the delivery of the facility’s services, which builds and nurtures patient confidence. Beautiful health now. The business focuses on the enhancement of health and image with a goal of moving patients in the direction of positive change. This includes both the medical and esthetic sides of the business and culminates in the Diamond Cosmetic program, which offers preferred pricing for esthetic procedures targeting skin health or image enhancement. This balance helps ease client apprehensions about indulging in medical spa services and instills enthusiasm for the chance to live better through medical science. No medical spa is an island. The facility realizes the benefits of having relationships with other talented providers, and, by forming and maintaining alliances with other medical professionals and businesses within the community, Be Medispa has become a medical image and human performance resource for its entire community. Best Industry Equipment: Bio-Therapeutic, Inc.